William Powell Frith (1819–1909), A Private View at the Royal Academy (1883), oil on canvas, 60 × 114 cm, Royal Academy of Arts, London. Wikimedia Commons. Pictures – be they drawings, paintings, prints, or photographic images – have a dual nature. They are two-dimensional representations of fragments of a three-dimensional world. It is only in our minds that we turn their 2D into a perceived 3D reality, and that transformation can be so convincing that we forget that they are only pictures. There are various accounts of naïve spectators at movie showings becoming so convinced of the reality of events shown in the movie that they react as if the images were real. This is told of early European viewers of the first films made by the Lumière brothers from 1895 onwards, who ran from an oncoming train, and later of those outside Europe when first shown movies on large open-air screens. Even now, among those who are far from being naïve, people watching ‘action’ movies on large screens still tend to duck and react physically to events shown in the movie. What I find most interesting about the stories of this occurring in the nineteenth and early twentieth centuries is that the movies shown then were in black and white, but this very obvious lack of colour apparently didn’t block their illusion of reality. The world in which we now live is rich, overflowing perhaps, with such 2D images, still and moving, but that has only been true for the relatively recent past. For many millenia, most people lived their entire lives without coming into contact with any such images. In this article, I look at the recent history of our exposure to pictures, prior to the arrival of mass-market magazines with colour illustrations, film, and television. Paintings, drawings, and other pictures such as those on the pottery used in the classical Mediterranean civilisations, are made one at a time by artists and craftsmen. This constrains the numbers available, makes the objects relatively expensive, and limits visual access to them. During mediaeval times, in Europe, the only opportunities for the great majority of people to see pictures of any kind were when attending church. It was the odd combination of the richest few, and monks and scholars, who had best access to pictures. Between 1450 and 1500, Johannes Gutenberg’s printing press changed this dramatically. During the 1490s, Albrecht Dürer started making high-quality prints, and his godfather, Anton Koberger, published the Nuremberg Chronicle with nearly two thousand woodcut illustrations. 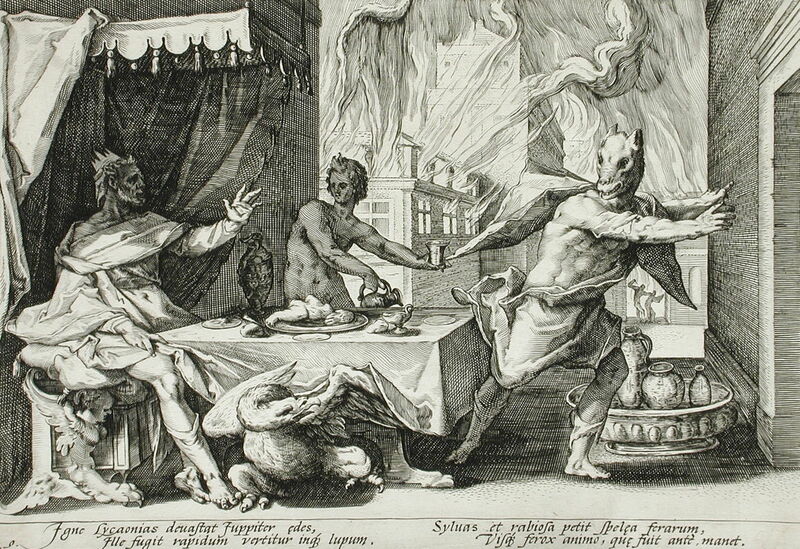 By the time that Hendrik Goltzius engraved this illustration of Lycaon Transformed into a Wolf in 1589, individual prints, collections of them, and illustrated books were available throughout Europe. But they were still expensive, and with low literacy levels even illustrated books were hardly commonplace. Laura Theresa Alma-Tadema’s painting of The Bible Lesson shows what must have been a common situation among the middle-classes during the Dutch Golden Age. In the room behind, a large printed copy of the Bible is open. 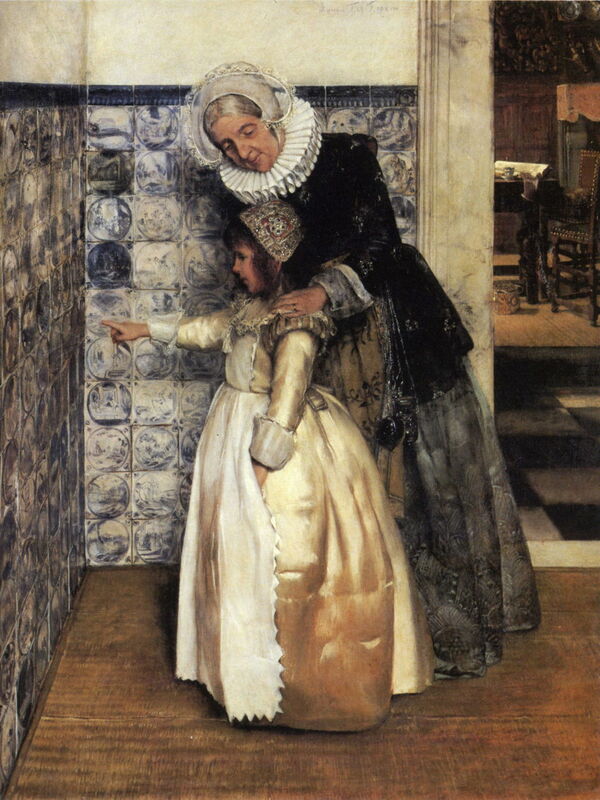 The girl and her grandmother (or nurse) have come through to look at the stories illustrated on Delftware tiles, which were probably the most widely-seen pictures in a great many households. Nevertheless, the more affluent middle-class also bought prints and paintings, typically kept in a ‘cabinet’ rather than displayed more widely through the house. Giovanni Paolo Panini (1692–1765), Ancient Rome (1757), oil on canvas, 172.1 x 229.9 cm, Metropolitan Museum of Art, New York, NY. Wikimedia Commons. Where there were paintings, in the mansions and palaces of the rich and privileged, they were often present in excess. 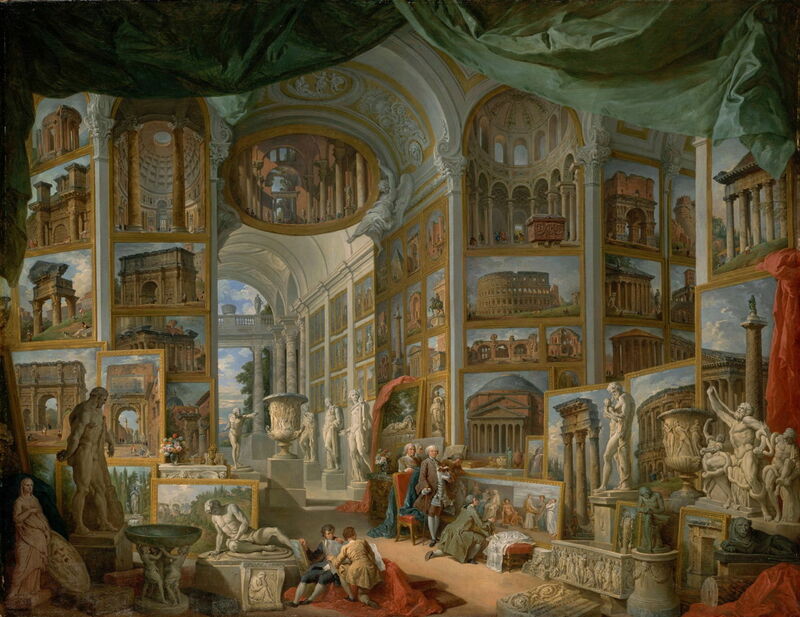 Giovanni Paolo Panini’s paintings of Ancient Rome (1757, above) and Gallery of Views of Modern Rome (1759, below) may have been imaginary, but make stark comparison with the more ordinary home above. 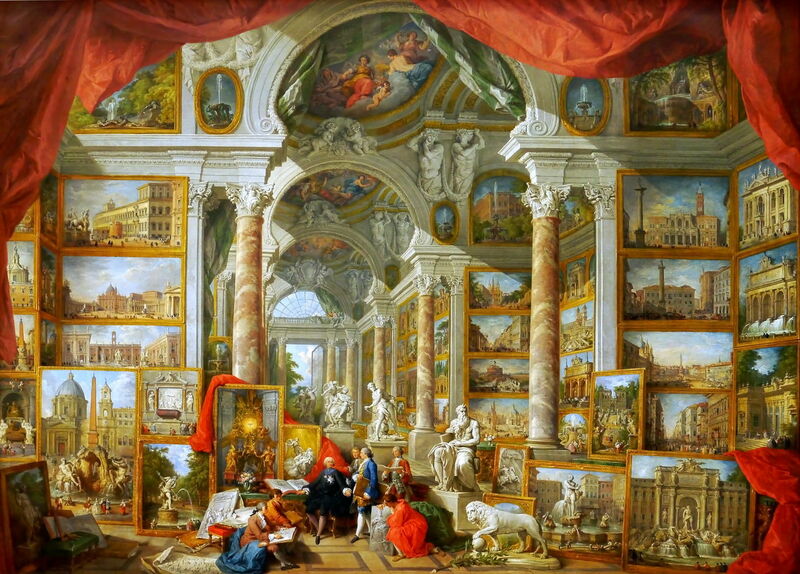 Giovanni Paolo Panini (1692–1765), Gallery of Views of Modern Rome (1759), oil on canvas, 231 × 303 cm, Musée du Louvre, Paris. Wikimedia Commons. 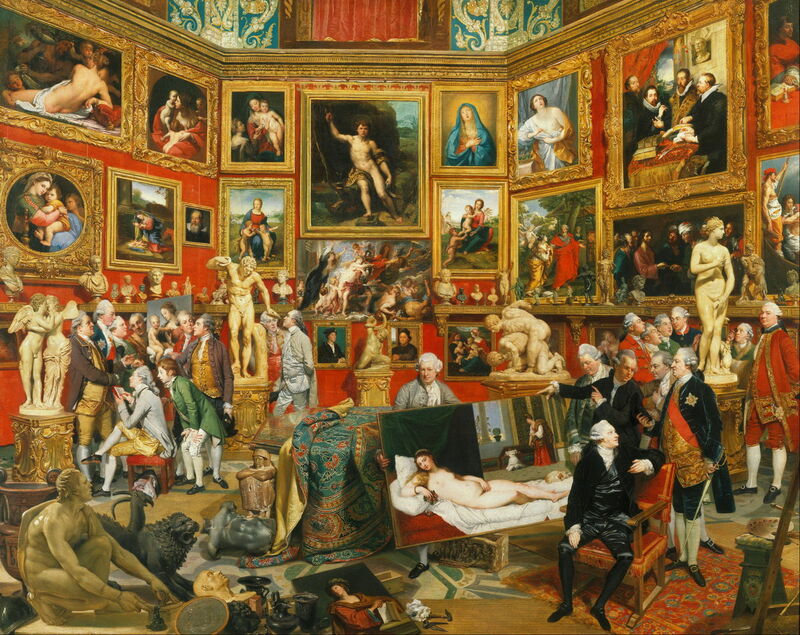 A more accurate reflection of the excesses which some attained is in Johann Zoffany’s Tribuna of the Uffizi (1772-77). This shows a section of one room in the palace which had belonged to the Medici family in Florence. It had only recently (1765) been opened to the public when Zoffany painted this for Queen Charlotte, who never visited Italy let alone the Uffizi, although she was the wife of King George III. 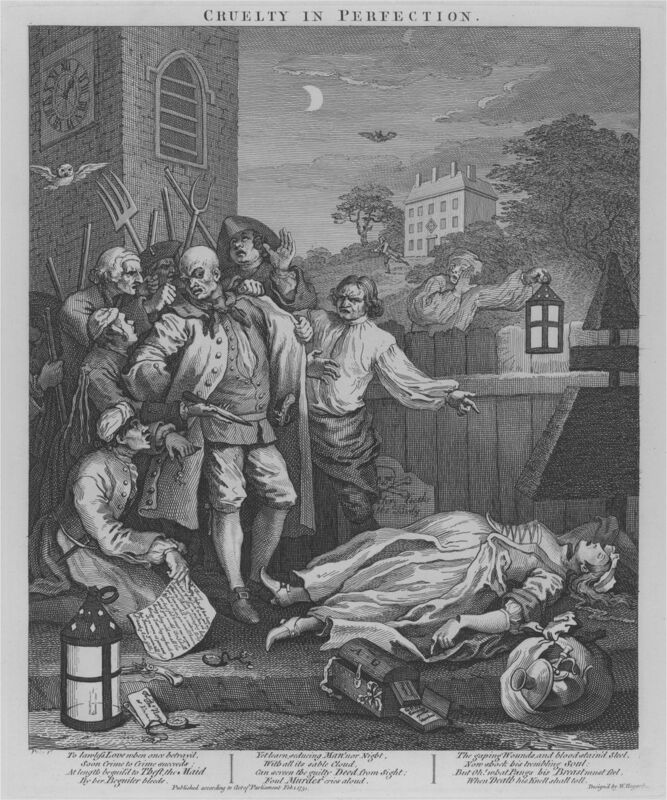 William Hogarth (1697–1764), The Third Stage of Cruelty: Cruelty in Perfection – The Murder (1751), line engraving on thick, white, smooth wove paper, 35.6 x 29.8 cm, Yale Center for British Art, New Haven, CT (Gift of Patricia Cornwell). Courtesy of Yale Center for British Art. If original paintings were out of reach of most of the population, those who published and sold prints were happy to cater for that market. Continuing improvements in technology, from papermaking to the rotary printing press, drove down costs and enabled higher print runs. For most painters, including William Hogarth, commercial success came not from the painstaking painting of single pictures, but from the subsequent sale of thousands of copies of an engraving, usually made by specialist craftspeople. 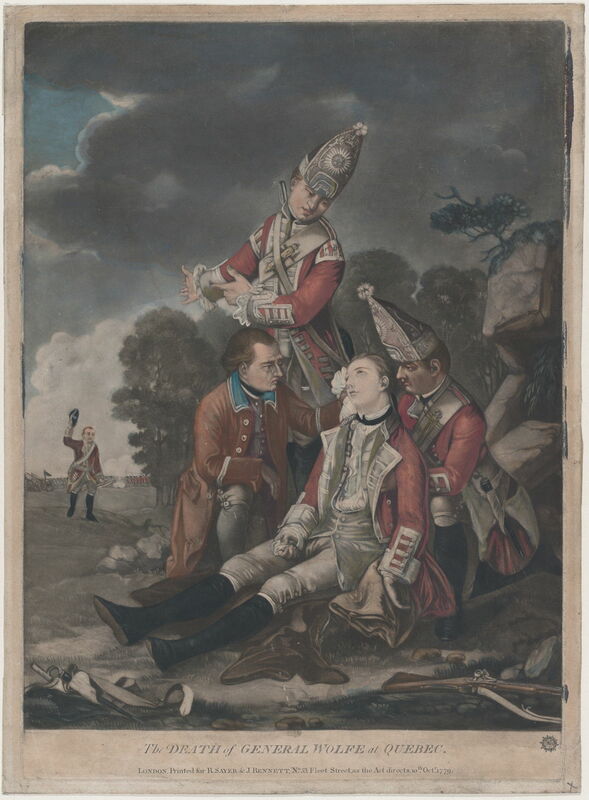 Edward Penny (1714–1791), The Death of General Wolfe at Quebec (September, 1759) (1779), hand-coloured mezzotint after original painting, 35.2 x 24.9 cm, The Metropolitan Museum of Art (Bequest of Charles Allen Munn, 1924), New York, NY. Courtesy of The Metropolitan Museum of Art. Colour printing remained elusive, though. Colouring by hand, as in the above example based on Edward Penny’s painting of The Death of General Wolfe at Quebec (September, 1759) (1779), catered for the upper end of the market, in limited runs of ‘art’ prints, but these remained expensive. 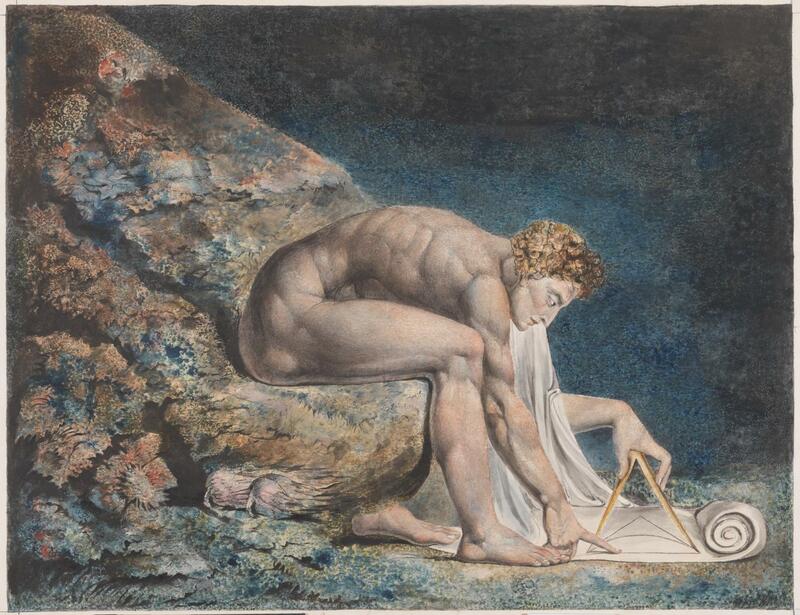 Some of the best examples of complex processes applied to prints are in the work of William Blake, who drew onto millboard on which he then made a wet watercolour, ‘pulled’ three or more watercolour monoprints from that, and finished each by retouching them with pen, ink, and watercolour. 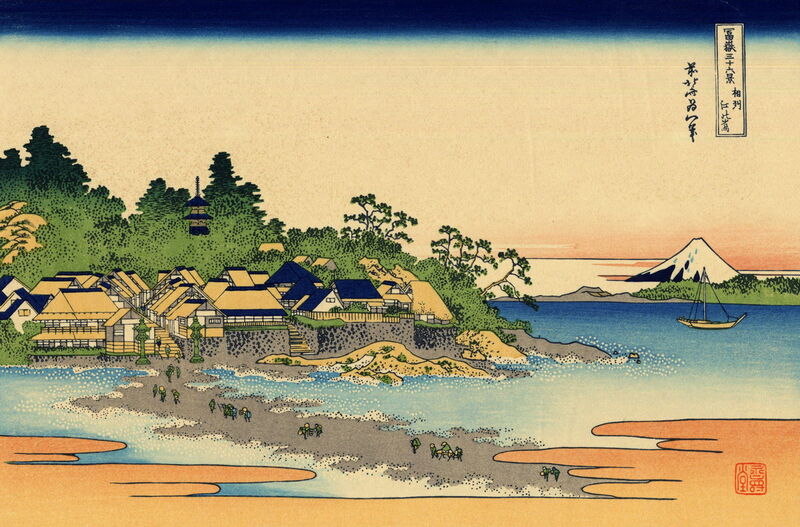 Katsushika Hokusai (葛飾北斎) (1760–1849),『相州江の島』 – Sōshū Enoshima (Enoshima in Sagami Province) (c 1830), woodblock print, facsimile of no. 25 of the series Thirty-six Views of Mount Fuji, further details not known. Wikimedia Commons. Colour woodblock prints became popular in Japan during the late eighteenth century, in the form of ukiyo-e and its relatives. Views by the great master Hokusai eventually became popular in Europe too, after his death. Robert Huskisson (1820-1861), Lord Northwick’s Picture Gallery at Thirlestaine House (1846-47), oil on canvas, 81.3 x 108.6 , Yale Center for British Art, New Haven, CT. Wikimedia Commons. As the middle classes were gaining better access to pictures, the hoarding of paintings by the upper classes was becoming extreme. 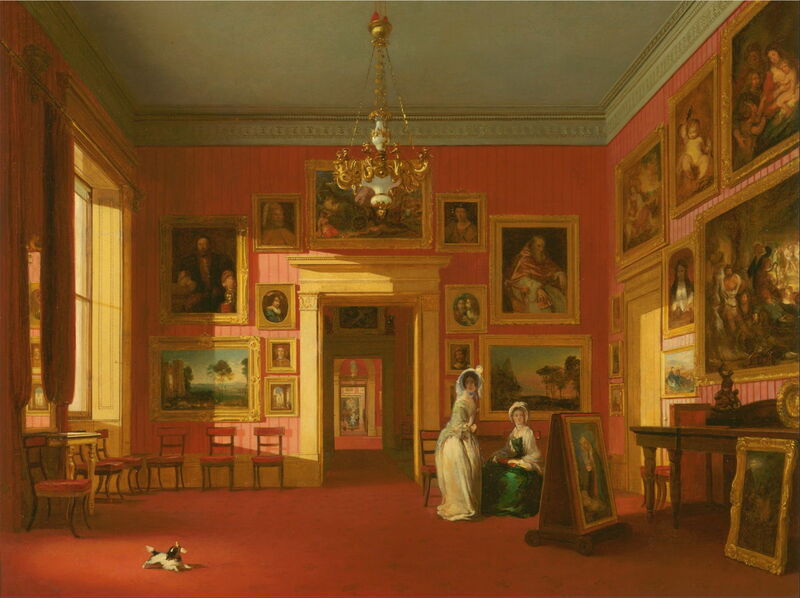 Robert Huskisson’s painting of Lord Northwick’s Picture Gallery at Thirlestaine House (1846-47) not only shows one quite modest collection of the time, but reinforces how few people were able to enjoy the paintings secreted in the mansions of the rich. New York’s Metropolitan Museum of Art in 1872. Many regional and provincial galleries and museums were also established during this period. Matthäus Kern (1801–1852), A Study Interior at St. Polten (1837), brush and watercolor on white wove paper, dimensions not known, Cooper Hewitt, Smithsonian Design Museum, New York, NY. Wikimedia Commons. The middle classes were able to indulge in a few paintings and framed prints of their own, although most would have been family portraits rather than anything of greater aesthetic or cultural value. 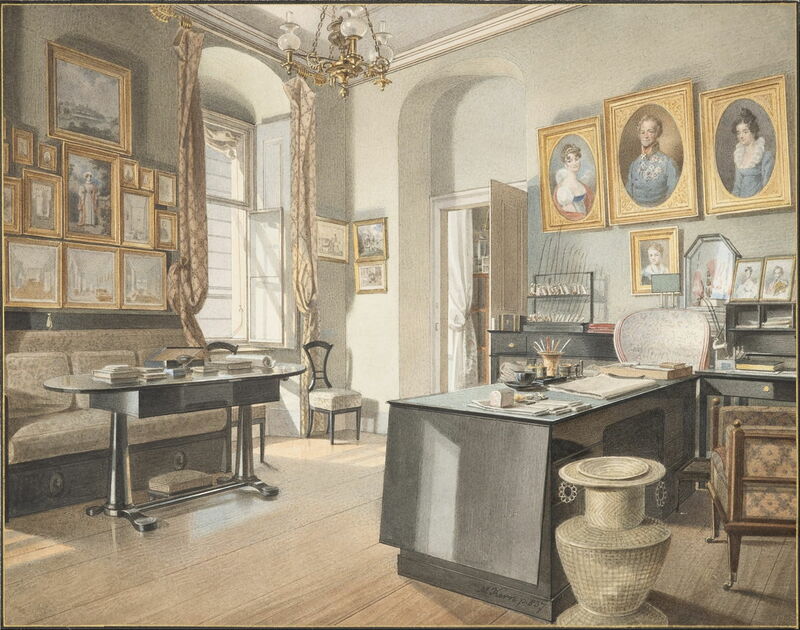 Matthäus Kern’s watercolour showing A Study Interior at St. Polten (1837) gives an idea of what might have been expected among the more affluent middle class, perhaps. As the older painters’ guilds were replaced by academies and societies, their exhibitions drew the middle and upper classes. The first Salon to be held in Paris took place at the Louvre in 1699, and the Royal Academy instituted its exhibitions in 1769. 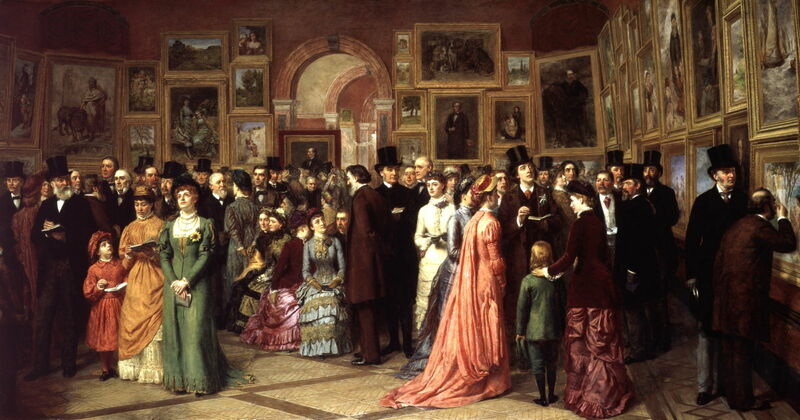 William Powell Frith’s A Private View at the Royal Academy (1883) shows some of the more select visitors to an exhibition, whose dress makes clear their class. Public viewing days were more catholic in their appeal, particularly at the Salon in Paris. By the late nineteenth century, prints and illustrated books were big business, although still largely constrained to black and white. 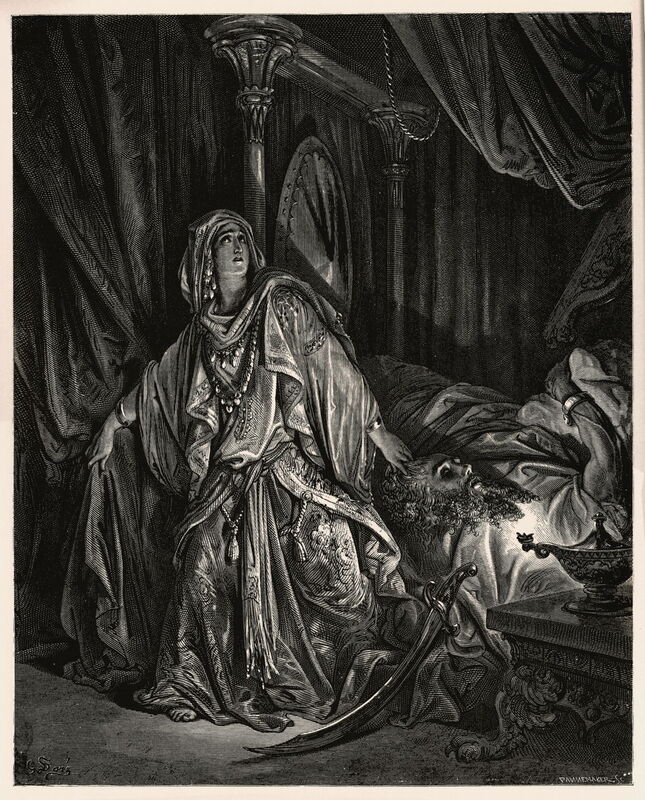 Artists like Gustave Doré made a comfortable living from illustrating a succession of books, in this case an edition of the Bible in French. 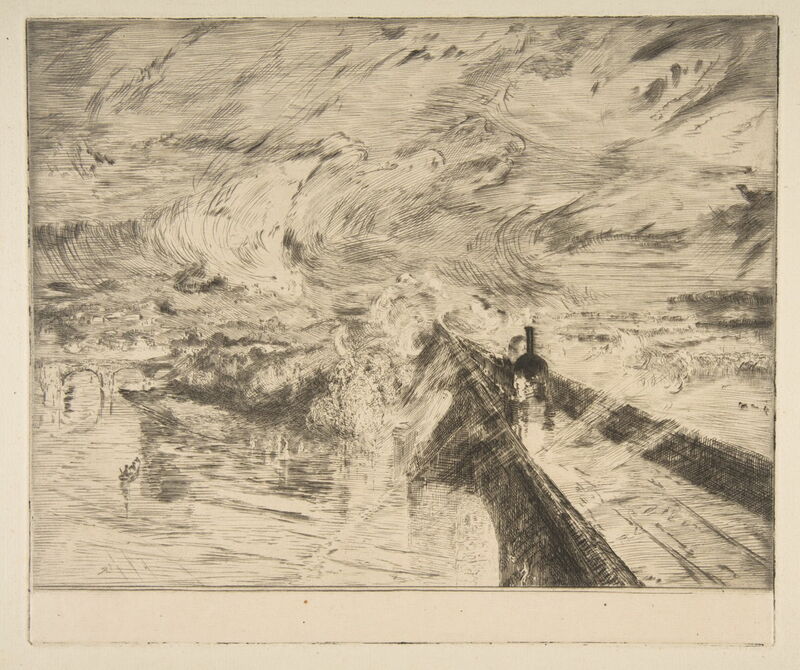 Félix Bracquemond (1833–1914), The Locomotive (after JMW Turner, Rain, Steam and Speed) (1873), etching and drypoint, 30 x 42.5 cm, plate 23.1 x 27.4 cm, The Metropolitan Museum of Art, New York, NY. Photo courtesy of The Metropolitan Museum of Art, The Elisha Whittelsey Collection, The Elisha Whittelsey Fund, 1990, at http://www.metmuseum.org. The most famous paintings of the day were often turned into prints, here JMW Turner’s Rain, Steam and Speed in etching and drypoint by Félix Bracquemond. 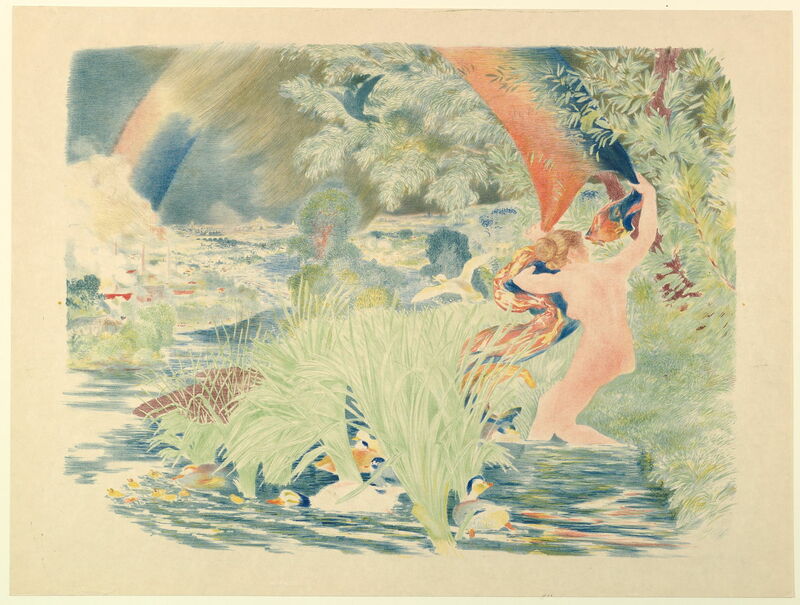 As an associate and friend of the French Impressionists, this print may have been exhibited at the First Impressionist exhibition in 1874. Increasing desire to improve the education of children drew attention to a gap in the market, which publishers soon filled with illustrated books for children. 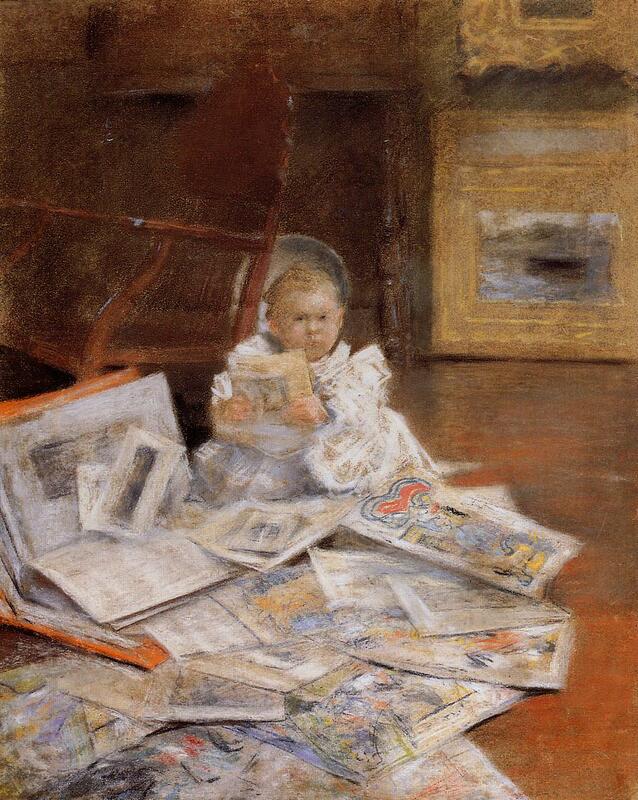 William Merritt Chase’s toddler seems quite content with anything that they can get their hands on. 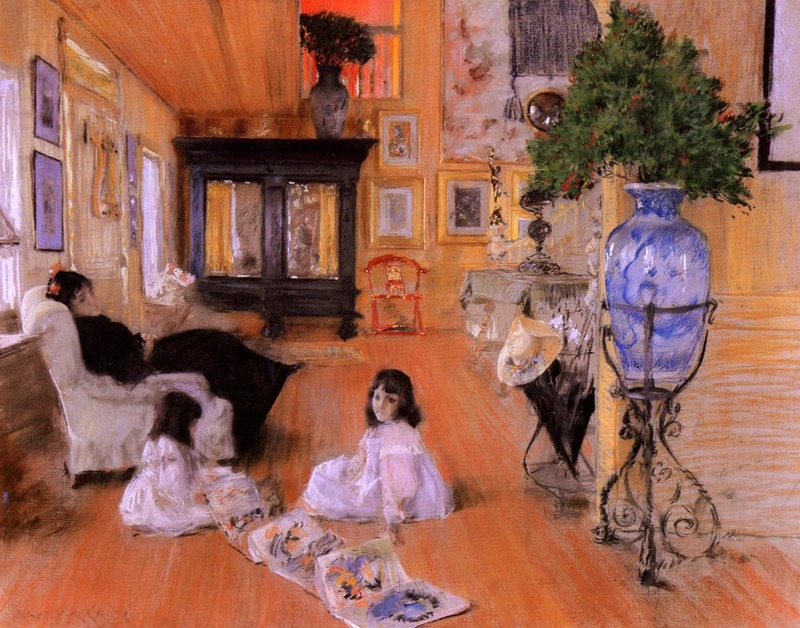 By the end of the nineteenth century, middle-class homes were able to have quite an abundant collection of pictures of various sorts, as seen in the hall of William Merritt Chase’s house at Shinnecock in 1892. Children were now being brought up in an environment that was rich in pictures, and learned their dual nature at an early age. Félix Bracquemond (1833–1914), Landscape (after 1885), colour lithograph, 47.6 x 62.9 cm, The Metropolitan Museum of Art, New York, NY. Photo courtesy of The Metropolitan Museum of Art, The Elisha Whittelsey Collection, The Elisha Whittelsey Fund, 1960, at http://www.metmuseum.org. Continuing improvements in print technology brought advances in colour printing. 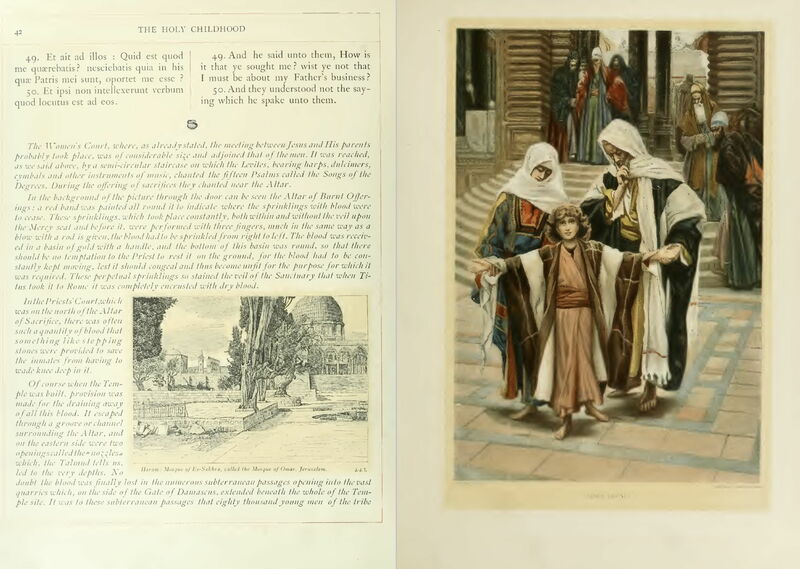 Although this colour lithograph by Félix Bracquemond catered for the ‘art’ market, colour illustrated books such as James Tissot’s The Life of Our Lord Jesus Christ (1899, below) were popular with a much wider readership. By the dawn of the third millenium CE, there can have been few children around the world who do not encounter pictures from soon after birth, and by the time that they are adults have not lived under a bombardment of still and moving pictures for much of the time. Another odd fact is that we have absolutely no idea whether our current immersion in all these pictures alters our visual perception. Two types of studies of this issue have been attempted. Assessments of South African groups in the 1950s have been claimed to demonstrate significant effects, but attempts to reproduce the results have shown serious methodological failings in the original study. In spite of that, the conclusions are still quoted without the major reservations they merit. Two American psychologists attempted to rear their child in an environment completely free of pictures, but had to abandon their experiment before the infant became two, because of his determined efforts to view pictures. Unsurprisingly, I don’t think that anyone has tried to repeat that study. Neither will we ever know whether differences in visual environment between, say, a non-privileged person living in the eighteenth century, and a modern person, result in any difference in visual perception. Looked at from here, the differences appear vast, and it seems hard to believe that there would not be differences in perception too. Posted in General, Life, Painting, Technology and tagged Alma-Tadema, Blake, Bracquemond, Chase, Doré, Frith, Goltzius, history of painting, Hogarth, Hokusai, Huskisson, Kern, narrative, painting, Panini, Penny, photography, Tissot, vision, Zoffany. Bookmark the permalink.